DERRY – Yes, the proposed farmer's market is still on track for a summer launch, although newly appointed market manager Beverly Ferrante is keeping plans close to her vest until she formally announces them during Tuesday's town council meeting. The idea for a farmer's market was brought to the council by Councilor Janet Fairbanks and former Councilor Brent Carney in the fall. Since then, the idea has caught fire and been fast-tracked by the Downtown Committee. Ferrante was selected by the town to head the project on a two-month, $2,000 retainer, which was announced earlier this month. Since then, there has been some confusion among some of the original committee members as to the status of the project, or what the process is moving forward. Bernadette Trafton, who was one of two others who applied for the market manager position, said she had done a lot of leg work and research already, and is disappointed she has not been asked to contribute her ideas. 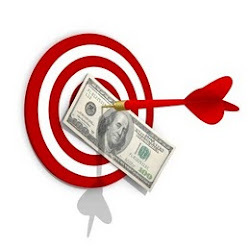 “I was a little surprised there was not an interview process after I submitted my RFP, but I did say that I wanted to be contacted by whomever was chosen to head the market. I was even asked if I'd be willing to help, free of charge – of course I will. To me, it's about having a passion for this, not about getting paid. I have a couple of businesses; I don't need to make money on this project,” Trafton said. Ferrante said she has been taking names and fully intends to bring everyone into the fold, once the council is on board with her initial report. Anyone interested in getting involved as a vendor or to help organize should contact Ferrante at 548-8799. Would centralized parking help boost economic development? DERRY – Parking and economic development are like the chicken and the egg: it's hard to say for sure which comes first. But the Downtown Committee is going to try to nail that down by forming a subcommittee to assess how much parking exists versus how much parking is needed during those perfect storms of activity, when the downtown is a draw for diners, show patrons, Gerrish Center activities and post-dinner bar grazers. Then, there is the larger question, of whether the downtown's lack of centralized parking is a deterrent to current and future economic development. But building a new lot or parking garage would be a major financial and logistical undertaking, one that likely needs to be in the master plan before it could be funded, said Michael Gendron, chairman of the Downtown Committee. 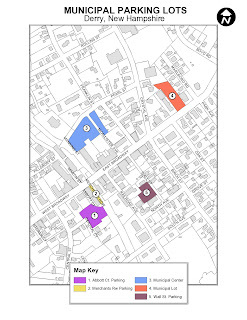 In the meantime, we asked Public Works Director Mike Fowler for an estimate of designated downtown parking, and he dusted off a map locating the town's five municipal lots which collectively provide about 300 parking spaces within a half-mile radius. Checking out the lots is an easy enough assignment, a circuit tour by car that takes about five minutes, but is easily walkable. Starting with the 66 spaces at Abbott Court, just a block from The Halligan Tavern and the Adam's Memorial Opera House, and two blocks from the Marion Gerrish Center, you can then drive one street east, to the 15 spaces at Merchant's Row, next to the Depot Square Steakhouse. From there, it's a a quick left and a right to the 100-space Municipal Center lot. If you take the scenic route, you can head down Pearl Street and turn right onto Crystal Avenue, then left at the light back onto Broadway, and make a left after the Fairpoint building into the 47-space municipal lot next to the Masonic Temple. 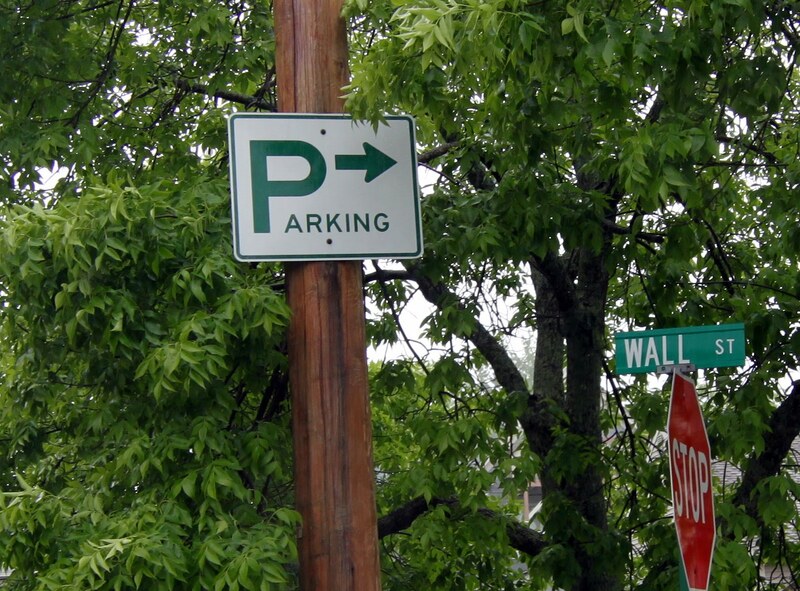 It is the fifth lot, Wall Street Parking, that may be the town's best kept secret. There is minimal signage visible on Broadway. However, if you follow the signs for Mary Anne's Diner parking, and then keep going on Wall Street, there is a big empty lot to your right. 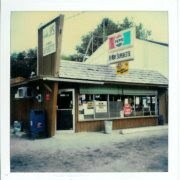 There is no sign announcing the lot, but it is 40 wide open spaces nestled between the VFW and an auto body shop. That puts four of the five lots where the concentration of night life is, west of Crystal Avenue. Lots 1 and 5 are only two-tenths of a mile apart – or a four minute walk, which brings Fowler to one of his talking points on parking. Another talking point is whether the signs are actually eye-catching enough. “In 2001 when the town did a program to take down overhead wires and lights, the signage was selected and some feel it is not very effective in pointing people to town parking lots,” said Fowler of the white 24-by-36 signs that hang on light poles featuring the work “Parking” with an oversized “P” and green arrow. “It had been suggested that we pick a different color, coral or red, or something that would stand out. But a white background with green or green with white is typical standard issue for parking signs,” Fowler said. Fowler mentions a bonus lot – Lot 6, which will be added to the map in August, when 19 spaces, currently under construction at the corner of Birch and Broadway, are completed. If you add in the two dozen or so two-hour horizontal spaces that line Broadway, by the end of summer prime time parking will peak somewhere beyond 310 parking spaces. On the down side, it's New Hampshire, where winter happens. A nice five-block stroll in sub-zero temperatures dodging snow piles and icy sidewalks is no way to start a fun night out, which is why advocates of a centralized parking area continue to press for consideration. Gendron said he is going to set a date and put parking on the agenda, where all ideas – from better signage and “where to park kiosks” to a full-on parking garage will be open for discussion. Anyone interested in getting in on the conversation should contact Gendron at michael.gendron@comcast.net. DERRY – It's Friday night at O'Hara Field, and a half-moon is rising over the third base line. The evening sky shifts like a mood ring, from cotton candy to sapphire. The lights are on and the crowd is pumped. It's the biggest night ever for the girls of Derry Little League Softball – their first time playing under the Friday night lights. “Girls, have fun. Welcome to history. Play ball,” said the voice from the announcer's booth, launching a dozen girls in red Brownell Insurance T-shirts and another dozen in maroon Greater Salem Footcare T's to their respective dugouts. After several years of planning, Derry Little League finally fielded its first four girls softball teams this season. Other firsts in store for the girls – full uniforms, participation in the All-Star game, pitching clinics, and winter workouts. But for right now, the focus is on helping the 48 girls in the 9 to 12 year old league to have some fun while learning the finer points of fielding. It's a process, says Hall. “We tried to field younger and older teams, but we couldn't get enough to register. We pushed,” said Hall. “Next year, we'll have more. Twenty minutes into the game Kristen Sobolewski is pitching for the red team. She winds up and lets go of one aimed right at the glove of Felicia Walalis, who is crouched behind home plate. It is a ball, high – so high, in fact, it's a good two feet over the head of Mackenzie Pierce, batting for the maroon team. Kristen shakes it off, along with whatever jitters there are when you are part of something this big. Someone from the bleachers reminds Kristin to focus, and take a deep breath. A team mate from deep left field has some other advice: “Or do the hokey pokey, if you have to,” a comment that makes the whole team smile, including coach Al Walalis. Across the diamond, Alanna Marcotte is waiting to bat. Musical interludes between batters delights the girls, who are right now dancing around to the theme of “Ghost Busters” in the dugout. Their coach, Rich Minassian, is getting an earful from Darrian Barker. “Coach, you need to teach us to slide,” she says, leaning on her bat and tilting her helmet up to make eye contact with Minassian, who is doing his best to suppress a smile. “That's what we're gonna do tomorrow,” he assures her, tapping the brim of her helmet which slides down over her eyes. Her teammates are momentarily distracted when Alyssa Amsler gets her hair caught in the Velcro of her visor. “Hold still,” says one of the girls, as the other two gently tug at her tangled tresses, eventually freeing the visor and doing a victory dance, as “Centerfield,” blares across the field from the sound system. In the end, Brownell edged Greater Salem Footcare, 13 to 12.. Colleen Pierce, mom of Salem Footcare pitcher Mackenzie, said watching her daughter pitch under the lights was a real moment, win or lose. “It's a great night here tonight,” Pierce said. Pastor Alice Ling checks out the space where it looks like a mother skunk found sanctuary under First Parish Church. Apparently all God's creatures are welcome here. DERRY – There's a big stink going on over at First Parish Church. For now, Pastor Alice Ling and her congregation are determined to grin and bear it – even if their eyes are watering. And no, that's not a euphemism for crying. “We think it happened sometime Monday or Tuesday,” said Ling of the the powerfully pungent unmistakably odoriferous stink of skunk that has permeated the building, thanks to a skunk family that has found sanctuary under the sanctuary. “We had an exterminator come out. He suspects there's a mother skunk and some babies under the tower,” said Ling, pointing to a place just under a side entrance to the church where there is a skunk-sized gap between some rocks. “He's been putting up one-way doors, but there is evidence of frantic digging, probably by the mother determined to get back to her babies,” said Ling. “We could cement it up and seal it, but then we'd have the stench of death along with the skunk smell,” said Ling, whose smile does not betray her state of olfactory distress. Windows and doors were left open all day yesterday to mitigate the malevolent misting, likely aimed at a predator who threatened the den of kits, said Parker Hall, a wildlife biologist with the U.S. Dept. of Agriculture. He said mother skunks often make dens underneath buildings, and quite often you'd never know it. But if a fox or weasel threatens her litter, a skunk's gonna do what a skunk's gonna do. Ling said it's not their first encounter with skunk – or other critters for that matter. They are a church that is as steeped in history as it is surrounded by nature. “A few years ago folks from the state came at twilight to count the bats in our tower – we were told we have one of the largest bat populations in New England,” said Ling, noting that an occasional bat will fly through the building. First Parish has a number of programs going on all day every day, hosting a preschool and various community groups. Some of the parents of preschoolers have complained about the smell, but everyone knows the staying power of skunk spray. As for the skunk family, Ling was told by her exterminator that if her congregation can hang in there for another week or so, the babies will likely follow their mother out into the woods and, with time, the stink will be little more than a musky memory. “Our sign out front says 'All are Welcome,' and that's the kind of church we are. We're big on hospitality. I guess that has to apply to all God's creatures,” said Ling. DERRY – Last night about 20 action heroes gathered at the Adam's Memorial Opera House to champion the next big downtown cause: Parking. There were other issues on the agenda, action items extracted from last month's Downtown Civic Profile meeting, including promoting a downtown farmer's market, sprucing up storefront facades, improving crosswalks on Broadway, launching a merchant's association and finding a new home for the Friendship Center, a meeting place for recovery groups. 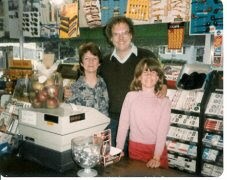 Marion Willis underscored that relocating the Friendship Center had to do with the smoking and socializing that goes on in front of the building, which can be a deterrent to foot traffic and counters the idea of marketing the downtown as a family-friendly shopping and dining destination. “The number of motorcycles that congregate on spring evenings can be intimidating – it's not the fact that the groups are using the building. But it would be nice if they had a different place to congregate,” Willis said. Planning Department director George Sioras told the group that he had spoken briefly with someone from the center following the Saturday profile meeting, who said they are willing to work with the town to find an alternate location. Group moderator Michele Gagne from UNH Cooperative Extension suggested that discussion over a merchant's group should be rescheduled at a time when more business owners could attend. Michael Lynch, owner of the Inkspot agreed that interest is strong, and said he felt that there was enough momentum to support a merchant's group that would enhance communication among downtown businesses, beyond the function of the Chamber of Commerce. From there, the group collectively brainstormed some action steps to get things moving on the other fronts. Letter writing and direct communication with town councilors and department heads was deemed the best way to get some immediate action on reviving faded crosswalks. Bringing concerns formally to the Highway Safety Committee was also discussed. Cynthia Dwyer, executive director of the Sonshine Soup Kitchen, asked whether the state might contribute to solving safety issues since Route 102 is a state highway. Improving the downtown aesthetic was also deemed a priority, one that would fall ultimately to shop owners, who could tap available funding through the Rockingham Economic Development Corporation for paint or sprucing up facades. Someone suggested that the first step would be to put pressure on businesses in violation of current sign ordinances. Dave Nelson said the Planning Board has recently taken a look at existing ordinances after some complaints surfaced over signs that appeared to be too large or too “loud” and seemed to detract from the overall quaint downtown vibe. “We have to teach people that signage is not the only form of marketing they can use to draw business,” Nelson said. Parking is a constant hot topic, one that resurfaces with every renewed discussion over economic development. There are generally two schools of thought – those who believe there is adequate parking that's just hard to find, or those who believe the need is so critical that only a municipal parking lot will solve it. “It really depends on who you ask. We have parking maps, and I think it would be good to take another look at the what the reality of the situation is,” Sioras said. “Having a walkable downtown is part of the goal – people need to get used to the idea that they might have to walk three or four blocks to get to their destination. Scientifically speaking, there's probably enough existing parking. It just might not be exactly where people want it to be,” Nelson said. Gordon Graham pointed to the way Derry is changing, and how that affects the need for parking. The other action item – the proposed farmer's market – has officially been turned over to newly named market manager Beverly Ferrante, who said last night that plans were gelling, and the official site selection would be announced later this week. “Pinkerton Academy is on board and we have eight vendors right now. We hope to get things going the later part of June, but no later than the first week of July,” Ferrante said. Updates on the market's progress would be posted on the town's website within the next few weeks, she said. The group decided to continue meeting as a committee to make sure that action is taken on as many of the goals outlined during the civic profile as possible. DERRY – Pinkerton Academy is in line for a grant that could earn the school $250,000 toward a campus security system, but they need online votes to win. The Pepsi Refresh Program is a grant program open to any school, business or community group that can come up with a worthy cause AND earn the most online votes. Pinkerton freshman Dylan Mahalingam submitted a proposal on behalf of the school, detailing the need for a security monitoring system to prevent vandalism and promote campus safety. It is now one of 1,300 projects in the running for a prize and, as of yesterday, ranked 79. The month-long voting period ends May 31. Pinkerton Dean of Students Glenn Aherns said voting was going fairly well at first, but has dropped off in the last week. He said the $1.3 million in grant money being awarded by Pepsi, which includes two $250,000 top prizes and several smaller awards, was money the company saved from not running Super Bowl ads. “I think that's great, that they can put that money to good use in communities. That's great advertising,” Aherns said. Individuals can votes once every day by going to http://pep.si/9klthi or by logging on to your Facebook account and searching for the “Pepsi Refresh Program” Facebook page. You can also search Facebook for Dylan Mahalingam's page, which is set up already with a quick link under his profile picture. DERRY -- Building a better prom at Pinkerton Academy means a year's worth of effort and elbow grease. Junior class advisor Jen Brown guides the process. 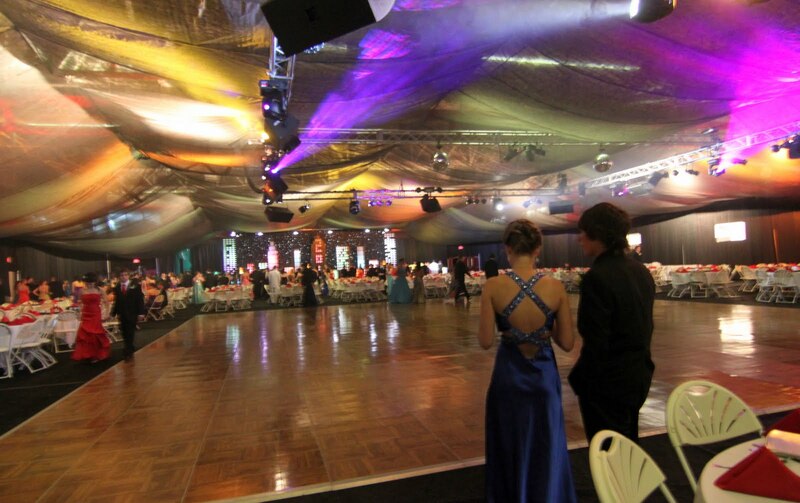 Junior Prom is The Event. The sophomore semi and senior banquet are equally significant in the scheme of things, but there is only one prom. “It's an elaborate fantasy. 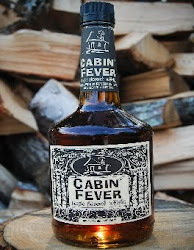 The kids are up for quite an evening,” said Brown, who knows of what she speaks. As a 1997 Pinkerton grad, she was on her own prom committee and vividly remembers the “Dancing in the Moonlight” themed soiree, a moment in time when the only thing bigger than the prom itself might have been the hair. This year, transforming the gym into a “Night in New York City” meant putting student ingenuity and local businesses to work – constructing a city scape, decking the wooden floor with asphalt-colored AstroTurf and draping the ceiling with gossamer, assembling Broadway-worthy track lighting and disco balls, installing a Statue of Liberty ice sculpture, ordering a menu representing the five boroughs of New York, and recreating a Central Park lobby with live plants, benches and a water fountain. 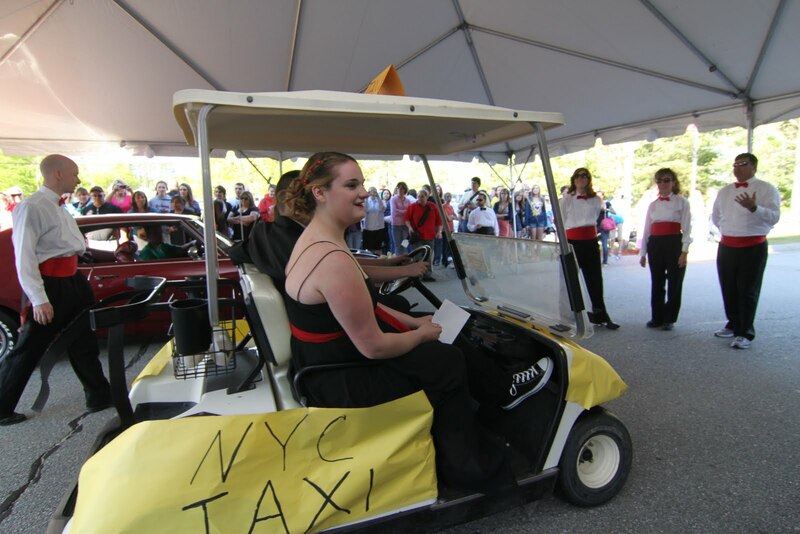 Outside, the red carpet entrance is another tradition that draws hundreds of curiosity seekers, paparazzi parents jam against the velvet ropes while students arrive in stretch limos, ski mobiles on wheels, moon bounce house-equipped trailers, horse drawn carriages, golf carts, antique convertibles – and an occasional police cruiser. 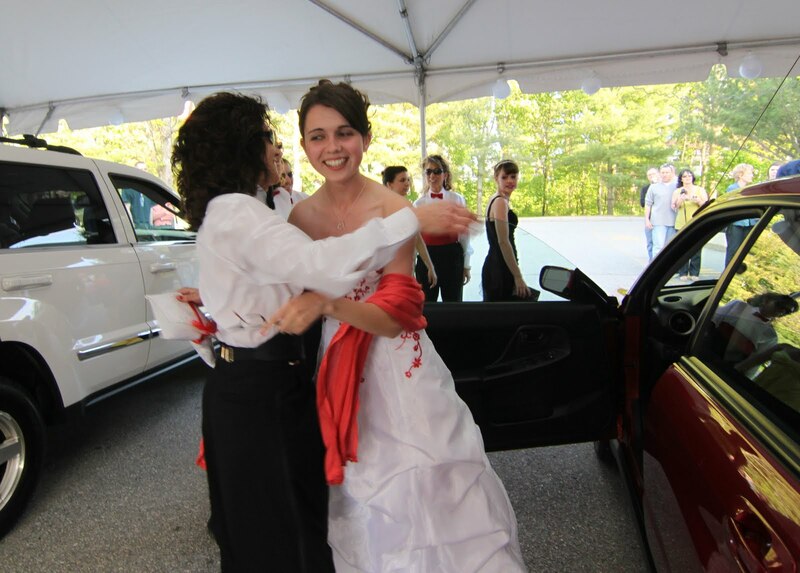 Teacher volunteers in white-and-red tuxedos provide valet parking under a big white tent. Friday afternoon, junior class officers Cody Diehl and Sydney Germaine are pulling it all together. They can hardly contain the excitement they're feeling, busting into occasional dance moves every time the sound system is tested. The white duplex at 3-5 Marlboro Road, next to the library, is one of several properties on the town's "ones to watch" list, sites of potential interest to the town. Although parking is needed, budget constraints may for the town to pass on purchasing the property. DERRY – Sometimes no news is neither good nor bad; it's just frustrating. For the Downtown Committee, waiting to find out whether the town has interest in purchasing a property for sale next to the Derry Public Library for future parking has been a waiting game. For some, the silence since the initial March 4 request has been deafening. “I'm disappointed with the council and the town, not to even acknowledge that the property has been offered at a discounted rate by the seller, who wants to help the town,” said Downtown Committee Chair Michael Gendron. Yesterday word was circulating that, without any word from the town, the seller was ready to put the house on the open market. 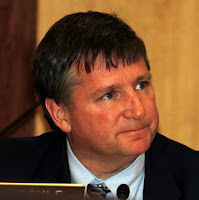 At the May 4 council meeting, Gendron spoke briefly during public comment, asking the council for an answer to the original question, of whether the town would like to buy the lot. “This (property owner) has been patiently awaiting a response. To this date, we have not had a conversation with you folks, and we would like a yes or a no or a maybe,” Gendron said. The property is assessed at about $189,000, but the seller would offer it to the town for about $155,000. During the March meeting, public discussion over possible purchase of the property was diverted to a non-public session, but library trustee Elizabeth Ives was allowed to speak generally about the need for more parking, which she said is critical. Currently the library offers 13 parking spots and two handicapped spaces. Ives said the municipal lot on the far side of the Masonic Temple helps, but also provides parking for other downtown businesses and library staff, and is still insufficient on days when popular library programs draw upwards of 75 people. At the March meeting, Public Works Director Mike Fowler reported to the council that the property could sustain up to 20 parking spots. Strategic options weighed by the Downtown Committee included having the town buy the property in two installments over two years at a cost of $90,000 per year, or for the library to use $40,000 from its capital reserve fund, with the town paying the balance. Yesterday, Gendron said the library faithful have lately considered other options, like pooling resources and raising the money independently, then fund-raising to pay it back. Ultimately, cash flow is the problem, said Councilor Neil Wetherbee, who is the council liaison to the library. He said the question should be on Tuesday's council agenda for a vote. The delayed reaction to the property owner's generous offer was due to timing, said Wetherbee – the council had to hammer out its 2012 budget before it could consider making any commitment to purchasing land. Add to the purchase price the additional cost of razing the building and paving, and it quickly adds up,Wetherbee said. Meanwhile, there are other potential parking opportunities in the downtown area, closer to restaurants and community centers, that should be weighed against the value and volume of 20 spaces next to the library, Wetherbee said. “We should be getting the most bang for our buck. No question, parking is an issue. But given the various options, if there is only one parking project we can do, the question is which parking project will it be?” Wetherbee said. Gendron said he understands the dilemma, and knows that the vacant lot next to the Adams Memorial Opera House has been a downtown parking dream for much longer than the Marlboro Road lot. Mostly, he would just like some news, good or bad. Indifference isn't working for him. 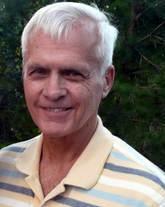 Rotarians holding a dinner to honor vets May 27. 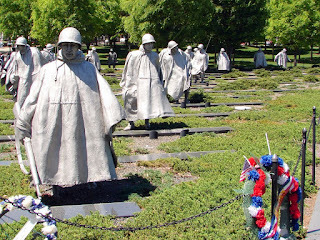 Korean War Memorial in Washington, D.C.
DERRY – This Memorial Day the members of Derry's two Rotary organizations – Derry Village Rotary and Derry Rotary – would like to honor those who served during the “Forgotten War” era, the Korean War, which lasted from 1950 to 1953. 92,134 wounded, 8,176 listed MIA and 7,245 POWs. A dinner with all the trimmings is planned for May 27 at the Greater Derry Boys & Girls Club on East Derry Road. Before invitations can go out, organizers would like to make every effort to find every Korean War era veteran from the Derry area who would like to attend. “It's our way of doing something nice for them,” said Eddie Leon, Derry Rotary member and chair of the Veterans Memorial Committee. "Last year we paid a special tribute to our WWII veterans by flying about 20 of them to Washington, D.C., to visit the WWII memorial. 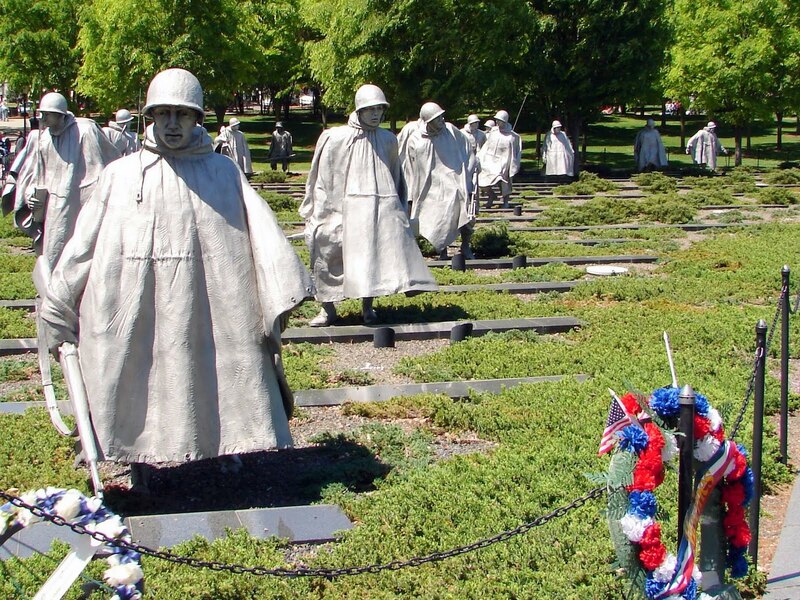 This year, we wanted to honor Korean War vets in some way, but there are many more of them. We just couldn't swing it,” Leon. Although the once-in-a-lifetime trip to D.C. was made possible through the efforts and generosity of many local businesses and individuals, it took a lot of coordination, and cost the Rotarians about $13,000. Only 30 Derry Korean War veterans have been identified so far through various contacts, including the VFW. But Leon said there are plenty more who may not be affiliated with any veterans organizations who should be included. Maj. Gen William N. Reddel III., NH Adjutant General, will be keynote speaker, and entertainment will be part of the recognition dinner, for which organizers are pulling out all the stops. 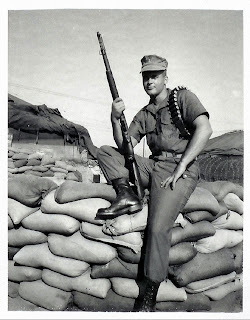 Any local Korean War era veterans currently living in Derry, or who have lived in Derry and would like to attend should contact Leon at 674-8144, or send an e-mail request to: heriberto83@yahoo.com. Transportation will be available on request. Jack and Lynne Goterch tending their garden.Jack Goterch prepares the soil in his plot. DERRY – Good fences do make good neighbors – if you're tending garden in a community plot, and keeping out pests is important to the preservation of your pumpkins and peppers. Not quite the interpretation Robert Frost had in mind when he penned “The Mending Wall,” a cautionary tale about boundaries and neighborliness. But poetry and planting go hand in hand for Lynne Goterch, who appreciates her two plot neighbors and their chicken wire; now she only has to worry about fencing two sides of her garden. On one side she is gardening next to her actual neighbor, Barbara Estabrook, who invited Lynne and Jack Goterch to sign up for a community garden plot with her this year. They are all newbies to the community gardens at Broadview Farm on Young Road. “I got an e-mail Friday that the plot assignments were made and that they would be staked out Saturday. I came yesterday to find my spot,” said Estabrook, who has a corner plot. Once again, demand for the 10 x 20 garden plots was such that the Conservation Commission squeezed in four more plots – there are 46 gardens this year divided among 34 gardeners said Peg Kinsella, who coordinates the program which is free to residents. All the plots are spoken for except for one raised plot, which would be good for someone who has trouble bending down, Kinsella said. 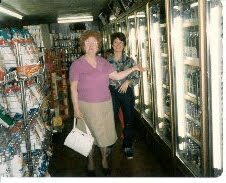 Estabrook , a Philadelphia transplant, moved in with her mother on Frost Road three years ago, but has known the Goterchs for as long as her mother has lived there, some 30 years. Barbara Estabrook with her Beananaza seeds. “My mom has a small garden, but she gives everything away to the nuns in Manchester,” said Estabrook. “Barbara is going to heaven. I'm hoping to catch a ride with her on her way up,” said Lynn Goterch, who has time on her hands, now that she's retired, to nurture some organic produce. Yesterday she helped her husband sift rocks from the dirt with her rake and pull weeds from the corners of their garden with her bare hands. While her husband heaves the rocks into the woods, Lynn Goterch leans on her rake, her hands crusted down to the fingernails with garden dirt. “I never wear gloves. I like to get my hands right in there, and break a few nails,” she said, taking a break to talk about her philosophy of life, which is a lot like her philosophy of gardening. “The woods are lovely, dark and deep,” she says ominously, her inner poet stirring as she quotes some Robert Frost, her favorite. No coincidence, said her husband, that they moved to a house on Frost Road. “I really am a Frost freak. I hated the house, but it was on Frost Road, and there were these beautiful birch trees in the back,” she said. The Goterchs and Estabrook will be using their communal spaces mostly for large produce, like pumpkin and Hubbard squash, but they will nurture some pole beans and tomatoes, along with their inner gardeners. DERRY – Six months after a tragic murder-suicide involving an elderly couple, the Attorney General's office has officially concluded its investigation, citing medical reasons. “The deaths of Judith Roberts and Claude Roberts were due to a murder-suicide which was likely motivated by Mr. and Mrs. Roberts' medical issues,” wrote Senior Assistant Attorney General Jefferey Strelzin in a final report, released yesterday detailing the Nov. 16, 2009 incident. Claude Roberts, 76, and his wife Judith, 73, were found by Derry Police shortly after a 911 call was made from their Shilah Drive home. The investigation determined the caller was Claude Roberts, who requested police assistance and then hung up without identifying himself. 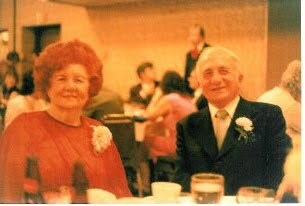 Police found Judith Roberts in her bed, still alive, with a gunshot wound to the head, and her husband already deceased, sitting in a chair next to her, still holding the .22-caliber revolver in his hand that he used to kill himself after attempting to kill his wife. Judith Roberts was taken to Parkland Medical Center where she died later that day. Strelzin said through family members investigators learned that Claude Roberts, who had some medical issues, was scheduled for surgery the following day, and a plan had been made for the couple to stay with a daughter for four weeks while he recuperated. Judith Roberts suffered from a number of “significant medical conditions” including dementia. Strelzin said no suicide note was written, but personal documents were left out indicating they were meant to provide guidance for the couple's three children. While the case falls under the umbrella of domestic violence, Strelzin said it is not a typical case. “We get these kinds of cases in New Hampshire, maybe once a year, a case in which one party kills the other motivated by medical concerns. For that reason, it's not typical domestic violence, but it's still classified as a crime,” Strelzin said. The tragic nature of such crimes is one reason why State Rep. Chuck Weed, D-Keene, intends to reintroduce a bill that would legalize assisted suicide. His previous efforts were thwarted in January when HB 304, Death with Dignity Act, was defeated in the House by a vote of 242-113. Weed said he was prompted to write the bill based on his own experience with his dying mother. He believes the greatest resistance comes from within the religious community, or conservatives who would capitalize on the current “rhetoric of death panels and choosing who will die” as a scare tactic. Weed said he believes the voters of New Hampshire would look differently at the bill if they were educated about concerns over the increasing problem of murder-suicide – particularly among the elderly – as a growing health concern. “The sad part was the opponents of this bill said you can take care of things yourself by just going in your garage with a shot gun. Anyone who's witnessed that kind of violent death might think differently about it as a good option,” Weed said. There should be options for those who, like the Roberts', may have felt trapped or desperate in a situation that could have been helped through a fairly new state program, said Kathleen Otte, Director of Elderly and Adult Services for the state of New Hampshire. Otte is also a member of the state's Incapacitated Adult Fatality Review Committee, formed three years ago and headed by the state Attorney General's office, to review cases involving any death involving the elderly. Otte is a firm believer in outreach services. New Hampshire was one of the first states to receive in 22007 what is known as a “caregiver grant,” federal money that goes directly to aid the needs of a caregiver. “Most often we're looking at a husband who becomes a primary caregiver who shoots his wife before he shoots himself, either because they don't know where to get the help they need or they don't want to share their burden with their children,” Otte said. Although the fatality review committee did not specifically investigate the Roberts' case, Otte said they fit the profile – they were married for decades, moving from Billerica, Mass., where they had raised their family, to New Hampshire in 2003. Claude Roberts was a Korean War veteran – a generation notorious for their stoic pride, Otte said. Otte said there are free resources available for individuals and families through 13 Service Link Care Centers located around the state. For more information, go to www.servicelink.com, or call 866-634-9412.